Pictures taken in Kepar, Kitti; Senpehn, Madolehnihmw; Lewetik, Nett. Photographic team included Daphne Anson, Pelsihner Elias, Jansen Santos, and Dalihlu Waltu. In the past there was a man who live on Salapwuk This man is called "Nan Kroun Salapwuk". 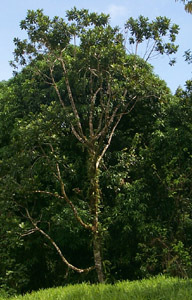 Nahn Krou is a witch doctor, he used many plants to cure sicknesses and make things out of. For instance, he built canoe out of "Sadak" stem and use "Dohng" as a stand for the canoe. He placed the canoe on two pieces of Dohng to hold up the canoe in order for him to carve the sides and the edges of the canoe. He also used Dohng for making houses up in Salapwuk. Because Dohng hardly decomposes or become weak. He uses Dohng stem as logs to make the floor and the branches are used for firewood. 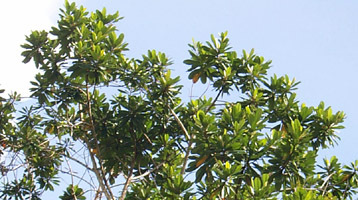 The leaves are used for fan and water holders. He is the first Pohnpean who introduced how to use Dohng to people. Today my family still considers Dohng as an important plant. We use it to build our pigpens and also as fertilizer. 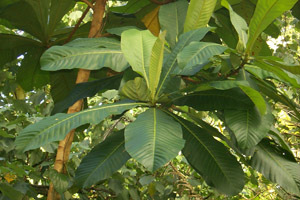 The leaves are used for fan and the bark as medicine. The fruits are used as medicine too. Birds eat the fruits and we use the fruit to trap birds specifically Mwuroi. We place our traps up where the fruits are. So when the Mwuroi birds come to eat they get inside the trap. 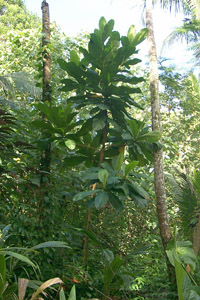 The trap we use is from the breadfruit tree called "Pwilin Moai". Mwuroi is considered the best meat for us who live up in the mountainsides. In addition, I still considered Dohng not an alien native plant in Pohnpei. But a plant that contributes many important purposes to us Pohnpeans, especially us who live up high in the forest or being a real Pohnpean. To conclude, Dohng helps us get our needs easily up in the forest. Every thing that I have said here is from what I have experienced. Life is possible up in the mountain with Dohng and other plants. I implore everyone to help us preserve this plant. We need plants for life. Plants serve an important part to all living things. 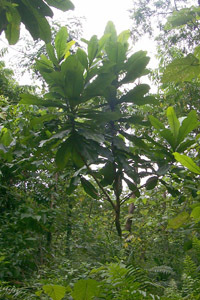 Plants and trees are the major source of life.